Ancestry: Addison Francis Wing; Nathaniel Wing, Jr.; Nathaniel/Uncle Natty Wing, Jr.; Nathaniel Wing, Rev War; Nathaniel Wing; Ebenezer Wing; Nathaniel Wing, KP War; Stephen Wing; John Wing, Rev. Born: October 24, 1892 in Bourne Ma. Died: October 30, 1974 in Bourne Ma. at 82 yrs, 6 d.
Where Lived: 833 Shore Rd. in Pocasset Ma. Married (1): May 11, 1916 in Bourne Ma. Married (2): August 18, 1923 in Bourne Ma. 1. Frederick Foster Wing; (December 28, 1925 – December 28, 1925); Frederick is buried in Pocasset Cemetery with his parents & sister, Carolyn. 2. Donald Elwood Wing; (May 21, 1927 – ? ); Married Catherine M. (Williams) Fernandez in Bourne Ma. on June 3, 1973; Catherine married (1) (–) Fernandez. 3. Elwood Wing; (1928 – October 11, 1995); Elwood died in Canton Me..
4. 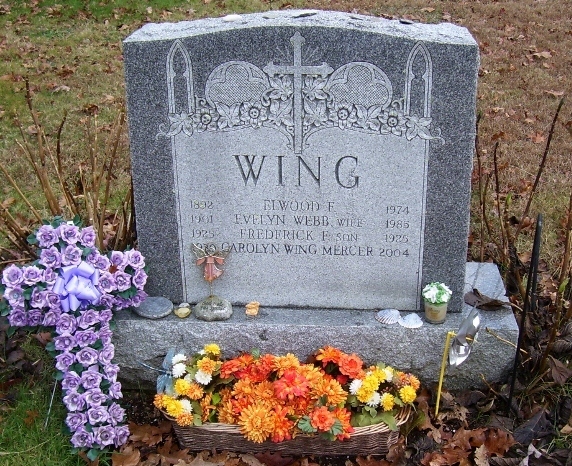 Carolyn Frances Wing Mercer; (February 3, 1930 – December 13, 2004); Married Frederick H. Mercer in Bourne Ma. on October 23, 1948; They lived in Rockland Ma. & had 5 children; Carolyn is buried with her parents & brother, Frederick Foster Wing, in Pocasset Cemetery.